Circular Flow! 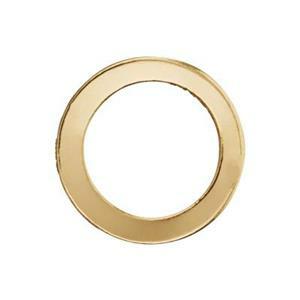 Keep your Jewelry Design Flowing with our GF2281 – 14/20 Yellow Gold-Filled, 10mm 24 Gauge Small Flat Circle Link. Choose from an array of our Gold-Filled Footage Chain to complete your piece. This circle link is lightweight yet has a sturdy feel (not hollow or cheap feeling). All of the edges are smooth. I like how the flat edge reflects the light. Will definitely reorder this item. This circle has no visible seams and no sharp edges. It feels solid yet lightweight.